This route starts in Northeast Vegas and runs in a loop northeast of the city. From Las Vegas: I-15 to Valley of Fire State park exit. Continue through the park and hit Hwy 167 towards Lake Mead. Right on 167 will take you back towards Hoover Dam/ Henderson/Las Vegas. At the end of 167 you can go left to Hoover Dam or right towards Henderson. Pick up Boulder Highway back to Vegas. Awesome scenery throughout the ride. Views of unusual rock formations and parts of Lake Mead are visible from several parts of the route. Interstate 15 portion is good, state park road is good, the desert harshness has not been kind to Hwy 167. Not impassable, but a few bumps in the road got our attention. Hold on! Amenities are more plentiful at the beginning and end of the route around Las Vegas. Once off the interstate, not much available. The State Park has restrooms and a small visitor center and scenic waysides. on April 29, 2012 4 out of 4 members found this review useful. My wife, Nicole, and I took the opportunity to enjoy the beautiful weather and hit the road. 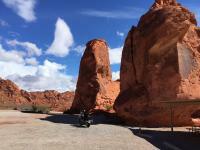 This is a beautiful ride with various twists and turns and phenomenal views through the Valley of Fire. As geocachers, we also picked up a couple eartcache's along the way. Overall the roads are well maintained with limited waterboarding. on June 2, 2013 3 out of 3 members found this review useful. This Ride is amazing! You gt to ride through 2 National Parks in 1 Ride!! Both of which are amazing. Be prepared to pay the fee for the Lake Meade Recreation area when you enter. It is not much. I buy the year pass for all parks. Lots of winding roads and turns make this ride fun in addition to the incredible scenery! This is in my backyard, so I frequent these roads. Today I did the official route, but backwards as described based on where I live and my starting position. Fuel up before entering. Either at the station on the I 15 or on Lake Meade blvd before you enter the park. There is no fuel inside the park. There MANY stoping points for photos and restrooms. I HIGHLY recommend this route and I am lucky I live so close to it. on March 5, 2015 2 out of 2 members found this review useful. This is one of my favorite rides. Absolutely stunning country. Do not miss this if you are in the Vegas area. It is only a couple hours or as long as you want it to be. Valley of Fire is one of the most beautiful places around, and the ride along Lake Meade is serene. You will not be disappointed. on June 6, 2013 1 out of 1 members found this review useful. Very nice run through spectacular scenery. I left Las Vegas c. 9am, tanked up along I-15, rode through to the turn off for Echo Bay (where there was a small boating shop that sold packaged food and beverages), and made it back to the city c. 1pm before the burning afternoon sun hit. All in all, an excellent day trip recommendation. Thanks. The roads all seemed well maintained. I would suggest taking the road to Callville bay and back, very scenic with good turns. Lake Meads entrance fees were $10 a bike so be prepared. I rode with two Cafe's and they semed to have a blast. Beware, there are plenty of park rangers out there to issue tickets. on November 7, 2012 1 out of 1 members found this review useful. I rode this route several years back on a rented Nighthawk, and found 167 to be pretty harsh. Recently moved to Vegas and decided to run it again, found the pavement to be MUCH better, nearly new with no bumps my suspension couldn't handle. I was a little nonplused when I came to the fee collection gate, but then I noticed there was no-one staffing it so I got into the area without paying a dime. Yay me. This was at 5:30 on a Sunday afternoon on the 1st of May; not sure if the timing had f**k-all to do with it, but I'll take it. I found 167 to be completely enjoyable. Lots of decent elevation changes, nice sweepers, nothing too technical. Do yourself a favour and take the turnoff to Callville Bay Road, some nice stuff in there too. on April 17, 2011 1 out of 1 members found this review useful. Best to head north on I-15 to Logandale/Overton turn off. Have a bite to eat in Overton then head south along the lake to Henderson. No fee going this way and a bit longer ride as well! on March 15, 2011 1 out of 1 members found this review useful. Easy ride to do from Las Vegas. Great scenery once off the highway. The toll for me and the bike caught me by suprise. Still worth the money and recommended. on February 14, 2011 1 out of 1 members found this review useful. I do enjoy the scenic ride through the Valley of Fire however, they now charge $10 per bike, the same as a vehicle that holds many more people. But if you're on a bus it's only $2! After 11 miles of riding to the fee station, we turned around and took the highway to Logandale! It's discrimination against motorcycles! on February 17, 2010 1 out of 2 members found this review useful. The 2 parks this loop passes thru are fee areas so be aware of this as you go. The state park has a self service pay station at either end so carry some loose bills, i believe it is a $5.00 or less per vehicle charge. This applies even if you are just driving thru and not stopping. The Lake Mead portion is a National Park area and is a seperate fee. Your National Parks annual pass will cover this area but not the Red Rocks portion. Hwy 167 is being resurfaced over the next year and should be improved soon. My last ride thru in Oct 2009, they were rebuilding 3 of the bridges and when complete the paving should begin. Hi All, is there any time of year that you cannot ride through the park? Thanks. This is a great morning ride, before the desert heat kicks in. Turn into Valley of Fire, or continue on to Overton and stop at "Sugars" for breakfast before hitting I-15 back into town.